Produced in Scotland : 100% pure cotton. Special Order Items Please Allow 4-6 Weeks for Delivery. 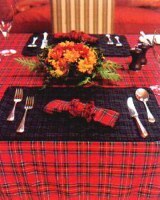 Please specify your choice of tartan. Irish National or Flower of Scotland.